Bradley Development’s affordable housing projects are expertly managed by InterMark Management Corporation. Our partnership with InterMark helps streamline both the development & the ongoing function of a housing community. 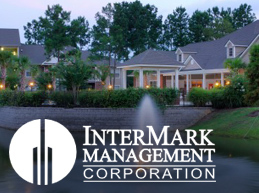 InterMark Management Corporation is a privately-held, full-service property management company with nearly 30 years of experience in managing apartment communities and approximately 9,000 rental units currently under management. Founded in 1986, InterMark has developed a proficiency in operating apartment assets that is unmatched among the providers of third-party management in the Southeast U.S.
Property ManagementHandling all aspects of day-to-day operations. This includes, but is not limited to: managing the physical premises, collecting rent & fees, repairs, etc. Asset ManagementKeeping the project’s fiscal accountability in check, VCM ensures that we’re always keeping an eye on the long-term goals. This also includes marketing services for the properties. Capital Needs AnalysisCoupled with general asset management, this service helps give us a clear view of budgeting needs, present & future.